It’s a special episode with our old LOST friend Alex Hahn! In the final hiatus and final season of LOST, Alex hosted two podcasts, Alex’s Hiatuscast and It Only Ends Once. He joins Anna and Wendy first for an extra long Never Let It Fade Away segment to discuss his LOST podcasts, and then for a discussion of the Swan orientation video, plus some of the mysteries we’ve been raising lately, and some trivia. Podcast length 1 hr 23 min. 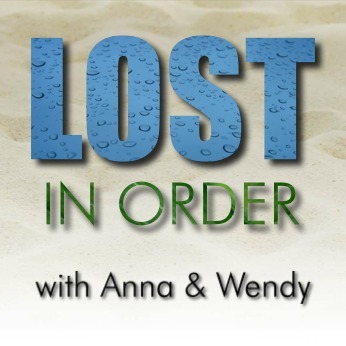 Anna and Wendy discuss episode 45 of Chronologically LOST, Episode 045 – November 5-6 2004 (day 45-46), featuring the raft crew making it ashore only to be captured by the suspicious Tailies, a mishap with the Hatch computer, the Orientation video, disagreements between Jack and..well, everyone…and Hurley dreaming of food after seeing the storeroom in the Hatch. Podcast length 1 hr 14 min. Never Let It Fade Away: The podcasts of Alex Hahn – Alex’s Hiatuscast and It Only Ends Once – and stay tuned for Lost In Order episode 45X, an interview with Alex plus discussion of Orientation and more! Anna and Wendy discuss episode 44 of Chronologically LOST, Episode 044 – November 4-5 2004 (day 44-45), featuring Michael and Sawyer on the raft and the descent into the hatch. Podcast length 1 hr 1 min. Anna and Wendy discuss episode 43 of Chronologically LOST, Episode 043 – November 4 2004 (day 44), featuring Aaron being kidnapped, time on the raft, Walt’s kidnapping, Jack and Locke’s first science vs. faith discussion, taking dynamite to the hatch, and Desmond’s morning routine being interrupted by an explosion. Podcast length 1 hr 33 min.